CY77: Package Deal! 3 properties totaling 86.39 acres with a Cabin deep in the Mountain Pine Ridge off Mollejon Road, Cayo! Package Deal! 3 properties totaling 86.39 acres with a Cabin deep in the Mountain Pine Ridge off Mollejon Road, Cayo! An exciting opportunity for anyone who wants to live in the deep forest of the Mayan Mountains in Belize! Indeed this opportunity for someone who loves nature, loves the wild and loves the adventure to invest in 3 properties that are priced to sell! These tropical paradise estates are nestled deep in the Mountain Pine Ridge off the Mollejon Dam Road boasting of spectacular sceneries with beautiful misty chilled mornings and majestic Sunset! The package includes the first property being a 36.1 acre which is the most developed property of the three (3). Approximately 3 to 5 acres have been cleared and nicely maintained and manicured and there are over100 fruit trees with a wide variety such as: different cultivars of Mangoes, Avocado, Sour Sap, Mamey, Tamarind, Blueberry, Golden Plum, Yellow Lemon, Custard Apple, Rolina, Tangerine, Grapefruit, Tamarind, Tangelo, Lychi, Chinese Plum, Rambutan, Loquat, Mamey Apple, Red Petay, etc… Majority of the trees have Weedmat on the ground around the trunk to protect weeds from growing and depriving the tree from nutrients. The property has a barb wire fencing with post and a gate to provide security. The entire frontage on the main access road is cleared and developed as mentioned which totals approximately 3 to 5 acres. The property inclines gently providing some panoramic views neighbouring Mountains. There is a small metal shed that serves as a garage for a well-kept and totally refurbished 1968 Massey Ferguson. There is an apiary with 13 bee hives. There are enough boxes for a least 5 more hives, Pierco plastic frames for at least 50 more hives, and a Honey Extractor. Bee keeping can be learned by joining the Cayo Quality Honey Producers Cooperative, where they will also buy the honey in bulk. The apiary is approximately 100 feet from the shed/garage making them strive in an area where no harm is presented to them or to anyone else. Also the area where the Bees are kept is in the lush forest and it is situated in higher elevation. The bees and fruit trees are excellent partners for pollination of the trees and honey production. There is also a water cistern to collect rain water for farm usage. A worker has been employed for the past five years and he will probably be interested in continuing. This area would be ideal to build the perfect home or Cabin and it would be as good as heaven! There are a couple of mountains on the property that will need to be explored and perhaps better home sites can be located. The title to this property is in process and with a deposit held in escrow it can be your property! The Second property consists of 36.29 acres which would be the same topography as the first property but in this instance the property is in lush forest condition. 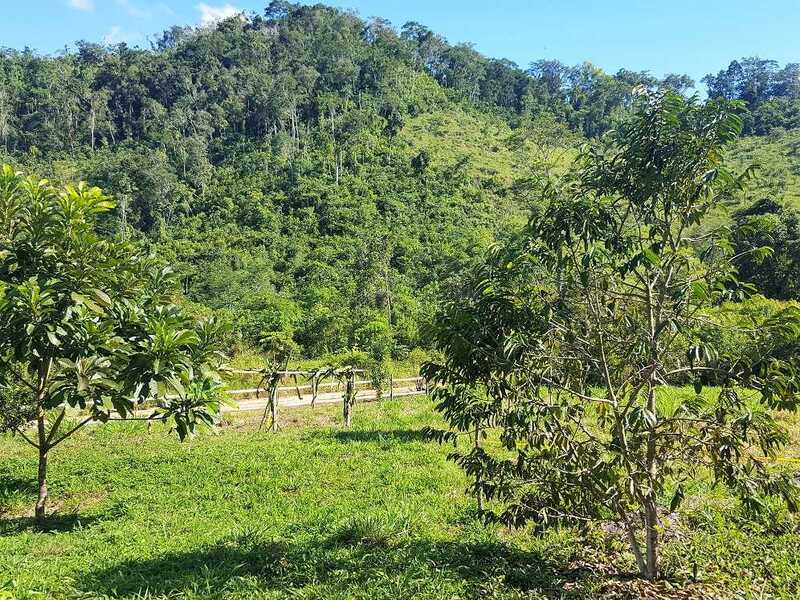 According to the owner there are also several small mountains and undulating terrain on the property which would be also ideal for a retirement property, farming, or eco-tourism development. The title on this property is also under process and waiting to get title from Ministry of Natural Resources but with an escrow deposit it can be yours! The third property is approximately 15 acres with a small Pine Treated wood Cabin sprayed with fire-retardant spray and consists of an open studio design with a shower stall with cold/hot water, toilet, kitchen sink, a tall kitchen cabinet, 4 burner butane stove, a working table, plastic table with chairs, single bed, 3 cots, and open ceiling with exposed rafters and 8 feet high ceilings. The Cabin sits alongside a hill and one side the cabin is 1 foot off the ground and on the other it is close to 4 feet off the ground. The size of the cabin is approximately 12×16 feet. Regular visitors include howler monkeys and other wild life. There is a 40 foot road easement that is not build yet, that gives access from the main road. The access road is adjoining the property number 2 above and can be seen on the map. However, the owner has been using a trail for over some years that has been accessed from time to time. The owner is trying to see if that trail can be approved a legal road easement but is not contingent to the sale of the properties. These properties are situated approximately under 15 miles from Benque Viejo Del Carmen, Cayo District. One must drive along the Mollejon Dam road, passing Arenal Village junction and deeper in to the Mayan Mountains passing the intersection to Mollejon Damn. One must then turn south on a narrow road for about 4 to 4.5 miles. The road is year-around accessible on a 4×4 but for about quarter mile or so the road is very narrow allowing passing for one vehicle at a time as there is the mountain on one side and on the other some deep ravines. The views are gorgeous but keep your hands on the steering wheel! It takes roughly 40 minute drive from Benque Viejo Del Carmen to the property! The property can easily be converted into an Eco-Tourism development as it has beautiful flora and fauna, numerous Caves and on the most important Mayan Ruins in Belize. Caracol is approximately an hour and half from the property. An Eco-Tourism development is about 4 miles from the property and is selling residential lots starting at $20,000.00US per lot. The tractor was rebuilt during a period of 14 months ending in August 2015 by a Mennonite mechanic, who has repaired only MF tractors for the past 50 years. A detailed list of all payments made and the receipts for parts purchased are available. There is also a 5′ bush hog for mowing, a DEK Commercial Chipper/Shredder, a Makita Brush Cutter, and a Simer Mini Vac Pump. The Tractor and all equipment are included in the sale. Belize real estate, real estate in belize, invest in belize, buy in belize, retire in belize, retire in Cayo Belize, home for sale in belize, belize home for sale, home for sale by owner, belize tourism, diving in belize, belize lot for sale, lot for sale in Belize, lot for sale by owner, residential property for sale in belize, residential lot for sale, hilltop home for sale, home on the hill for sale in Belize, belize invest and sell, beach home for sale in Belize, home beach for sale Belize, belize land for sale, belize properties for sale, land for sale by owner in belize, belize home land owner, buy and sell belize, belize sell and buy, bullett tree road belize, cayo district, san Ignacio town belize, santa elena belize, river property for sale Belize, belize riverfront for sale, farmland in belize for sale, belize farm, belize development, retire heaven in belize, why retire in belize, why invest in belize, Belize spa for sale, Camolote Home for sale, Home for sale in Camalote in Belize, Belize homes for sale, sale of homes in Belize, Belize houses for sale, Belize houses real estate for sale, retire in Camalote Belize, Cayo real estate, real estate in Cayo for sale, Cayo home for sale, Belize home for sale in Cayo, Franks Eddy, Cave tubing Belize, Cotton Tree Village, farmland for sale Belize, belize real estate, real estate in belize, real estate agents Belize, Belize realtors, Belize Tourism, Belize diving, Belize retirement act, cheap living in Belize, Belize investment, belize homes for sale, house for sale in Cayo District, Land for sale in Belmopan, land for sale near Belmopan, land for sale near Belize Christian Academy, Retire in Belize, invest in Belize, Qualified Persons Incentive, Belize retirement persons incentive program, Belize river property for sale, hilltop land for sale Belize, invest belize, belize invest, land for investment in Belize, business for sale in Belize, buy-sell-invest-belize, land for sale in Cayo, land for sale in Mount Pleasant area Belize, Society Hall road, Teakettle Village, Coconut farm for sale, farm for sale in Belize, business for sale in Belize, invest in Belize, retire in Belize, coconut farm in Belize for sale, coconut farm for sale by owner in Belize, Teakettle Village, Belize River farm for sale, Ontario Village, sell and buy in Belize, land for sale along Belize River, Belize River land for sale, real estate agent in Cayo, real estate agent Belize, realtor in Belize, island for sale near Placencia, island for sale in Riversdale Village, beachfront island for sale in Belize, island real estate, Belize island real estate, Placencia beachfront for sale, retire in Belize, retire on an island in Belize, Caye for sale in Belize, Cayes for sale in Belize, Belize island for sale, island for sale in Belize, invest in island in Belize, build your home in Belize, retirement in Belize, Belize retirement, Belize realtor, Belize real estate agent, Belize real estate buy and sell, why invest in Belize, Belize immigration, Belize expats, exapts in Belize, development for sale in Belize, beachfront acreage for sale in Belize, beach lot for sale Belize, Belize beachfront for sale, beaches for sale in Belize, Belize invest in beachfront, condominium in Belize for sale, Placencia Beachfront, Beachfront Hopkins for sale, land development in Belize, Belize Land Development, development in belize, the reserve in Belize, sanctuary Belize, sanctuary bay, mango springs belize, belize buy and sell, sell in belize beachfront properties, home on the beach for sale in Belize, master planned development for sale in Belize, invest in Belize, realtors in Belize, Belize realtors, belize real estate agent, agent in Belize for sale, land sold by agent in Belize, Dangriga Beach for sale, islands and cayes for sale in Belize, real estate belize, belize real estate, invest belize real estate, retire in Belize, retire by the beach in belize, Vaca area reserve, Mountain Pine ridge, Mollejon damn, Challilo damn Belize, forest reserve, Friends of Conservation, Caracol mayan ruin, Benque viejo del Carmen, want to retire in Belize? The best country to retire in the world, belize growing real estate market, ask about the Retired Person Incentive, Qualified Retirement Person Act of Belize, buy farmland in Belize, buy raw in Belize. << CZ55: OFF THE MARKET!!!! Tropical Home a stone’s throw away from the Sea in Sartenejea Village, Corozal!